(Stuart W. Mirsky is the principal author of this blog). In light of Martin Heidegger's enrollment in Nazism during the early days of Hitler's rise to power in Germany, and his failure to recant or explain himself (though he did resign his position under the Nazis and go into semi-retirement after a year), and in light of evidence of his complicity with Nazi anti-Semitism in those first days when he was a spokesman for National Socialism in the German academy) . . . and, given the opacity of his thinking itself . . . why does he continue to be an object of philosophical interest for so many in philosophy today? Hasn't his engagement with Nazism fatally undermined his credibility, even if one can make sense of his thinking? Heidegger took philosophy away from the subject-object distinction that has engaged it in the West since Descartes, arguing that there is no real separation between us and the things of our world because the world is neither constituted by subjects in a world of objects (dualism which conceives subjects and objects as distinctly separate modes of being or substances) nor is it just subjects holding ideas of objects in their minds (idealism), nor merely physical stuff which has the power in some configurations to masquerade as the mental (materialism). Instead he rejects these categories in favor of refocusing our attention on what it means to stand and operate in a world as aspects of it characterized by awareness. For Heidegger the world is a kind of continuum and human beings, as subjects, are inextricably in it . . .
. . . All valuation begins with truth discernment because that is the first order of valuation, the first sorting we must do as living creatures. But human beings, because we have a cultural dimension to our lives, made possible by the cognitive capabilities that enable us to conceive our disparate sensory inputs as a world, move beyond this level, beyond the recognition of the true and the false, to the valuation of things in terms of their effects on us. The idea that value questions are not amenable to truth determinations is simply wrong. Truth is just another form of valuation and, as the most basic form there is, the underlying ground for all the other claims of value we can make. The idea that moral questions are cut off from claims of truth is misleading because, insofar as moral valuation is valuation at all, it comes from the very same place our truth claims come from. . . . I've been critical of Chomsky's theory of language here based on having viewed several of his talks and interviews on Youtube from over the course of the last 40 or 50 years. Seeing little change in his explanations, examples and claims over that period, I've concluded that he hasn't made all that much progress since his earliest theories about the innateness of language. But perhaps I haven't been totally fair to him because in at least some of the later talks he offers a more concrete thesis about what he means when he refers to the sudden occurrence of language in humans (which he places as occurring somewhere in the past 70,000 years or so). He argues that since language requires a computational capacity and there is no evidence for language-capable thinking in human artifacts prior to that time (but indirect evidence of it, in the presence of symbols, art and decorative imagery in the archaeological record, from at least around that period), this capability must have appeared in one human (because it involved a mutation) at some point back then. And it must have occurred full blown. . . .
Frege and Russell made language central to philosophy in the twentieth century and Ludwig Wittgenstein made ordinary language the core of our interest, how it shapes our thoughts and deeds, how it structures our picture of the world. In the 1950s, Noam Chomsky came on the scene with a radical new take on language though, a new take that partook of old ideas. Picking up from the 17th and 18th century thinkers, particularly the rationalist tradition but also the early empiricists, Chomsky argued that language was so complex that it could not possibly be merely learned by us as children. Rather, he posited, there must be a deep, inherent set of rules encoded in our brains which enable language to grow in us the same way the human embryo grows arms and legs, the infant matures, the child passes through puberty, etc. Language, that is, on his view had to be inherent in creatures like us or it could not occur at all. The old empiricist tradition which had challenged rationalists like Descartes and rationalist reformers like Kant and others writing in his wake, must have gotten it wrong, Chomsky argued. Kant and his supporters had it right: There must be a structure to experience which arises in the brain itself and which is built in, not learned by trial and error of the organism. The old empiricist idea of the tabula rasa had to be mistaken. . . . So why does truth matter? Why not lies when lying serves our interests better and we can get away with it? What's the big deal with telling the truth, respecting the facts? Doesn't everyone have his or own "truth," i.e., his or her own way of understanding their world? Can we deny the right of each to believe as he or she wishes? And if what we believe conflicts with what someone else claims is true, why should we trim the sails of our own beliefs to their wind? Who do they think they are anyway? Is their "truth" better than ours? . . . This is a second draft of an essay I am hoping to include as a supplement to Value and Representation (an early draft of which is offered below), possibly to publish the two together. 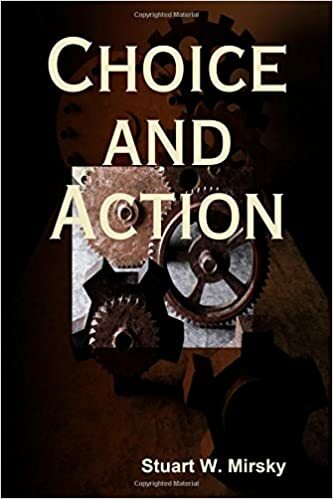 My earlier work, Choice and Action, left some matters insufficiently elaborated to my way of thinking, at least it appears to me to be so in retrospect, and it now seems important to plug those gaps. Value and Representation, when completed, will address the question of how valuing works as a necessary feature of our kind of cognitive capacities (which produce a life of using and relying on reasons), an explanation to which I alluded all too briefly in that earlier book. This essay addresses the other gap I left: the question of how religion qua the spiritual project in human culture provides a basis for arriving at and defending our moral judgments. Most in the modern world think it important to divest moral or ethical questions of specifically religious concerns and this has led to much sturm und drang in philosophy since, bereft of some metaphysical justification, moral judgments seem to hang loosely in a kind of cognitive limbo. We cannot find consensus on whether they are rationally derivable from the rules of reason itself (Kant) or are merely the feelings we have or learn in our lives, converted by some linguistic legerdemain into fake propositions (emotive expressions masquerading as cognitively significant thoughts). Since arguing that moral claims are intuitively established fails (we obviously don't all share the same intuitions even if many of us share some) because of the need for them to be arguable if they are to work as advertised, and since religious claims are inherently contentious with no obvious linkage to moral matters other than the fact that many moral beliefs in human history appear to rest on religious belief, we are left with a lack of support for our moral judgments as moral judgments. But if there is nothing underlying them, moral judgments must seem to be no more than a kind of fakery, and then anything pretty much goes. But clearly THAT is not how we live our lives. This essay, therefore, aims to revisit the possibility of lodging moral claims in the spiritual dimension of human experience. Without arguing for any particular religious point of view, I want to make the case that there is a commonality in the many expressions within human cultures of the religious enterprise and that that commonality is precisely where the moral question comes to rest. I want to make the point, further, that religion is not just some has-been project of the human experience but that, whatever the successes or failures of its particular expressions in the history of our species, it remains a continuing and vital aspect of human life. Last week I had a brief exchange with a philosopher in the Midwest, who is pursuing a project to explain why our value judgments should not be cognitively disqualified as merely emotional expressions of personal likes and dislikes. His view is that normativity, the reference we make to our valuational standards and our behavior in accordance with them, is as integrally involved in the presumably objective discourse of science as it is in our moral claims. Therefore, there is no strong reason to reject the notion that our moral claims have cognitive content just as our descriptive claims do. By showing that normativity plays an integral part in scientific (purely "descriptive") claims, he aims to show that being normative is not disqualifying for moral judgments as such. I think he makes an interesting point although I think he errs in equating valuing (including the moral sort which is, after all, the controversial kind) with so-called normativity. So I thought I'd repeat here a few of my comments to him (though I will not include his own remarks unless and until I check with him about his willingness for me to do that). One point I took him to be making was . . .